Already building a reputation for unique and innovative game design, Thunderkick studio have delivered many memorable slots titles in recent years – think of Explosive Esqueleto, and Flame Busters to name just two. And with Spectra slot, they’ve done it again. 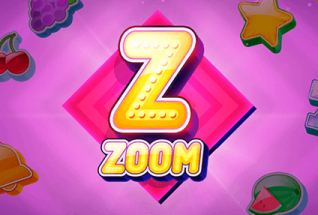 This game has a cool futuristic feel, maybe a little like NetEnt’s famous Starburst™ Slot. 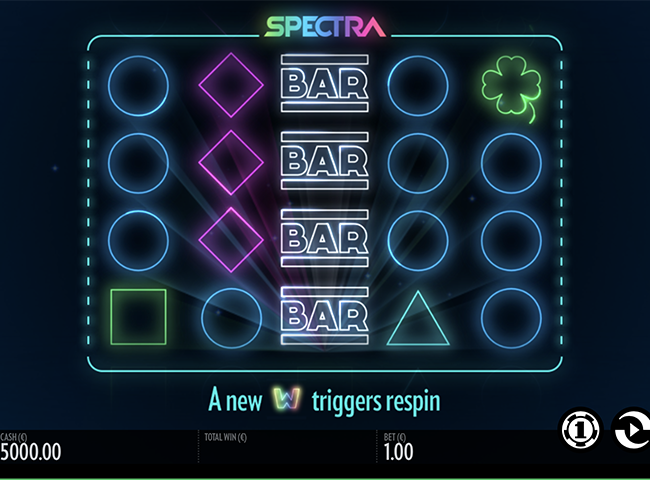 The 5 reels are lined with neon symbols on a black background, and the word Spectra ripples with the colors of the rainbow at the top of the game screen. For some, Spectra slot machine may be a little short on features – it’s really just about scoring Wilds and Re-Spins, and you could argue there’s a bit of style over substance, but when all is said and done, this is a great looking slot. Plus it does have a very cool Wild Nudge feature – but more on that in a moment. There are 30 paylines to win on, and a 2,400x jackpot. The Spectra RTP is 96.4% and the volatility rating is somewhere around medium for us. 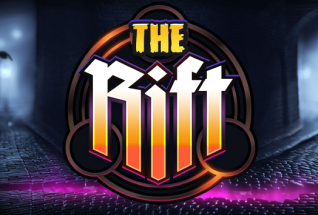 You can play right now on mobile, desktop, or tablet, at one of the many recommended casinos on this site. Why not try Casumo Casino? Or if you’d prefer, read on for a full game review. Neon and futuristic, but weirdly reminiscent of the 80s – that’s the order of the day here. The symbols are line drawings of shapes: a square, a circle, a triangle, a pentagon. And then some traditional slots symbols in the same style: the Bars, 4 leaf clover, lucky number 7, and bell. Look out also for the really cool big W symbol – the Wild. All Thunderkick games have the same layout – configure your stake from 10p to £100 when you click the casino chip button. Toggle the sounds on and off in the bottom left corner of the screen. The soundtrack has a suitably cheesy sci-fi quality to it, with almost a touch of disco or techno from the 70s and 80s! Ok, so on to the good stuff. It’s all about the Wilds here –there are no scatters, and no Free Spins. However, the Wilds come in stacks of 4, and if you should be lucky enough to land 5 in a row on a payline you’ll win 20x your stake. So, with every Wild landing anywhere on the reels you’ll earn yourself a re-spin, and with each re-spin the Wilds will nudge close to the center of the reels, meaning you get closer to a full stack of wilds each time. So, if you land a Wild at the top of one reel, with the re-spin a second wild will appear above the first. Score another Wild with the re-spin, and the stack nudges ever further up or down, bringing more chances to win. And that really is that. Just to say that with some of the win sequences the animations and sounds are really top notch. Just what we’ve come to expect from Thunderkick. Another unique slot from Thunderkick Games. The affects and sounds are superb, and the clever nudging wilds feature is pretty exhilarating as you add more Wilds to each stack. 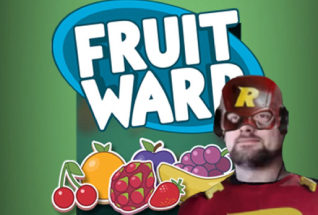 Maybe a little lacking in features for some players, but worth a go nonetheless. 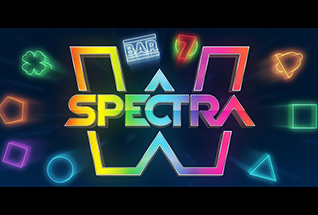 Spectra slot gets the thumbs up from us.